A new study may help us better understand the qualities of leadership after studying several mammalian societies, including elephants, meerkats and humans. With contenders hitting US media headlines everyday regarding the Republican and Democratic nominations for US President, the topic of leadership is a popular one in America today. The researchers have published some interesting perspectives on the nature of leadership in the journal Trends in Ecology & Evolution. How similar are human and non-human leaders? Spotted hyenas cooperate when hunting, capuchins pull together in fights, and chimps travel together, but the common ways that their leaders promote those collective actions has remained an enigma, the authors explained. Nobody really knew how much human leaders in small-scale societies have in common with the captains of other mammalian societies. To try to find out, a team of psychologists, mathematicians, anthropologists and biologists got together at the National Institute for Mathematical and Biological Syntheses and reviewed the evidence for leadership in four domains: food acquisition, movement, within-group conflict mediation, and between-group interactions. Human leaders generally have less power over their group compared to non-human mammalian societies. Their aim was to separate patterns of leadership into five categories: power, emergence (achieved vs. inherited), distribution across individuals, relative payoff to leadership, and generally across domains. Despite what the current presidential primaries may lead us to believes, in this study the researchers found that leadership is generally achieved as the individual gains experience, both in non-human and human societies. As is usually the case in nature, there were some notable exceptions to this rule. Among spotted hyenas and the Nootka (native Canadian human tribe) leadership is inherited rather than gained through experience. When compared to other mammalian species, human leaders are not really so powerful. Leaders in non-human societies wield much more power over their group. Prof. Smith says the similarities are probably due to similar cognitive methods governing dominance, subordination, decision-making and alliance formation – we are, after all, mammals too. Humans take on more specialized roles within society, which may partly explain the difference (between human and non-human leadership traits). The team aims to further quantify the different dimensions identified in their latest study. There is still a great deal more to learn, they said. The study was funded by the National Institute for Mathematical and Biological Synthesis, and supported by the National Science Foundation and The University of Tennessee, Knoxville. Citation: “Leadership in Mammalian Societies: Emergence, Distribution, Power, and Payoff,” Jennifer E. Smith, Sergey Gavrilets, Monique Borgerhoff Mulder, Paul L. Hooper, Claire El Mouden, Daniel Nettle, Christoph Hauert, Kim Hill, Susan Perry, Anne E. Pusey, Mark van Vugt, Eric Alden Smith. Trends in Ecology & Evolution. November 6, 2015. DOI: http://dx.doi.org/10.1016/j.tree.2015.09.013. 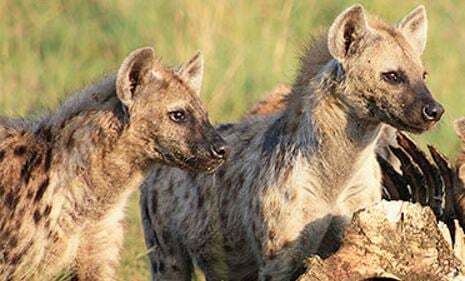 Spotted Hyenas live in clans with a complex, matriarchal social structure (a female heads the group).